Hey guys, I think this is the last cutscene that I’m gonna show off. I’m almost finished with them, just gotta do a few more for the ending. Final number should be around 44 images. Rather than doing multiple endings, I’ve settled on one ending where you unlock more of it by completing more stuff in the game. Also, I’ve edited 6 of the images into wallpapers for my Patreon. They’re in 1920×1080 resolution, and they’ll be included with the final game too. 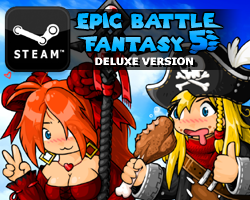 This entry was posted in Epic Battle Fantasy 5 on March 18, 2018 by Matt Roszak. I’m already noticing how much charm this game has, so much excitement! Well, a bit like breath of the wild’s ending? Matt pulling a Bullet Heaven is hilarious. Lance quite literally losing his sh*t is even funnier. I’m pretty sure it’s a reference to Brawl Royale Ending. What aspects of the game is there yet to complete? I see from the top right corner that the game is 85% complete so what kinds of things are there left to be worked on? This isn’t asking how long until the game is released, but I think it would be interesting to everyone know how you’re working on the game at the moment. Storyline? Weapon design? Secret stuff? Idk, just wondering. Is it possible to change the game over screen to a short cutscene or something? That would be a cool and unique thing to add. On one hand, I second that suggestion. On the other, I really don’t liike to lose in the first place. Heck, sometimes my computers crash at or even before Game Over screens for some dumb reason. Haha, I love that Matt is surfing the vortex with the sword. will actually be canon AND makes it obvious enough how to unlock it. 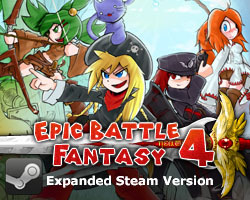 As a 20+ years old player, EBF series always brings me into a fantasic fairytale, although not a big-budget productions, it contains most factors that the traditional RPG game had. For me it’s the AAA tier game~! Hi, i know the game is not finished yet but i think a NG+ feature would be cool, also adding some extra stuff for NG+ would be awesome. Anna and Nolegs are just going Weeeee!